Inner voices suggested a different course. Trail-worn elk moccasins turned about and struck off in the opposite direction. This new still-hunt progressed over the rise and down into a small valley. The depression’s south end spilled into a dense, difficult-to-navigate thicket: little brush-covered islands the size of a half-grown heifer interspersed with standing water and fallen trees. The trail that followed the edge of this thicket circled up the hill to the west, passing downwind of a large white oak that met its demise perhaps five years earlier. This unfortunate hulk lay sprawled upon the hill’s crest, having fallen to the north. Purple raspberry switches entwined with broken limbs and branches. Near the tree’s top, a thin strip of leaf-covered ground led through the wreckage to the white oak’s main fork. The left moccasin cleared the leaves away; the blanket roll eased into the secluded nest. In the fall of that year, 1796, wild turkeys frequented that doe trail, both morning and evening. Sunlight reflected off the sleeves and collar of my white ruffled shirt, but was of little consequence. Sequestered within that lair, only my nose, eyes and long gray hair remained visible to passersby. If the opportunity arose, the death bees would swarm before a turkey’s wary eye detected the ruse. But that morning remained quiet, the change in direction proved unproductive. With the sun creeping higher, I reached in the pocket of my wool, sleeveless waistcoat and retrieved an orange silk scarf. The scarf was wadded, but already rolled tight and tied. All I had to do was unwrap it, adjust my hair and pull it down in place, just above my ears. “Now you are chasing squirrels,” the historical me whispered. I leaned the Northwest gun against the main limb, pushed up on my knees and slung the portage collar’s leather brow band over my shoulders. The bedroll settled against my back, a bit lower than normal—the collar’s long straps, wound several times around the rolled blanket, stretched a bit during the still-hunt that brought me to the oak fortress. 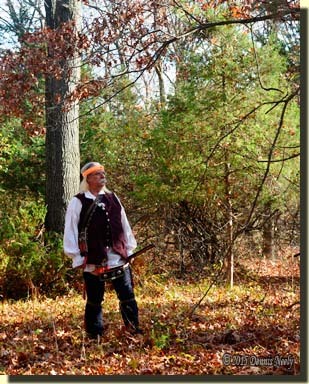 Changing direction sometimes produces miraculous results, but not on this particular traditional black powder hunt. Sometimes it pays to listen to an inner voice and sometimes it doesn’t. But from the traditional woodsman’s perspective, the point is to be ever vigilant, just as the critters of the forest are ever on alert. On occasion, changing direction, or at the least being vigilant for opportunities a new path offers, has proved beneficial and rewarding. I recently attended the Indian Art & Frontier Antiques Show, held at the Washtenaw Farm Council fairgrounds, 5505 Ann Arbor-Saline Road, Ann Arbor, Michigan. Last year there were a number of original Northwest guns on hand, and I was hoping to see them again. Well, that didn’t happen, and it never does when I plan ahead and have a list of questions. Darrel Lang and I both examined this artifact and I took several photos. The compass wasn’t for sale, only display. We talked with the owner and asked questions. All he knew was what “a compass guy” told him. He had no maker’s name and we could find no maker’s mark. He was told it dated “prior to 1850,” but that was about all the information he had. “Prior to 1850” covers a lot of history, and certainly doesn’t place it in the 1790s, but it doesn’t rule it out, either. Comparing the original to the reproduction uncovered as many similarities as differences. Both are brass. When open they appear similar. I didn’t have any facility to weigh the original, but it felt much lighter that the reproduction which weighs 3 ounces. The difference is in the case construction. The brass used in the original is clearly thinner than that of the reproduction. The case of the original measured 1-11/16 inch in diameter. We didn’t screw the top on to get an exact thickness, but it was close to 1/2 inch tall, give or take a frog hair. The reproduction case is 1-3/4 inch by 3/4 inch. The lid of the original screws on; the fine threads can be seen in the upper photo. The reproduction’s lid slides over a lip. The same lip exists on the original, but with external threads. Other than two engraved lines, the two brass faces, or hour dials, bear a striking resemblance. What look like caricature legs with striped stockings are present on both, the original might have rudimentary “buckle shoes?” The sundial vane, or gnomon, was missing on the original, but the mounting stubs that remain are close in size and shape to those of the reproduction. The needles are different, the original looks like a sword, rather than a flat bar. 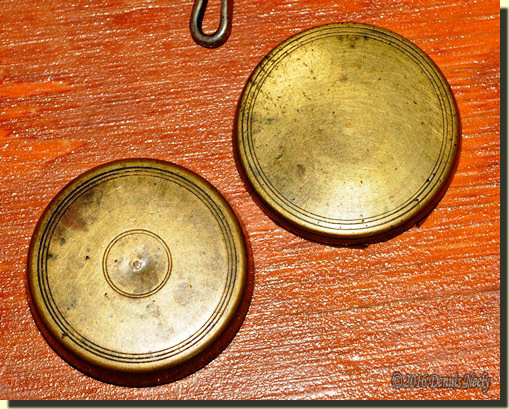 Both are blued and have a brass “balance” point in the center. If I read it right, the “T” that forms the handle marked magnetic north. The paper faces are different, yet similar. They both have an eight-pointed star about the center, the points alternating red and blue in color. The original has an additional eight small points in black and white for the intermediate directions. The reproduction’s star is larger and the abbreviations for the directions face the center, outlined within two concentric circles. The original appeared to have hand-lettered initials, resting above lines perpendicular to the center, with more directions present. There is a distinct variation to the letters, which supports the hand-lettered notion, but I have no idea how the maker could print so small. The outer cases are similar, yet different, too. The original sports engraved circles on both the top and bottom. The top has three lightly engraved circles at the outer edge. The bottom had three such circles plus two more close to the center, perhaps a half inch in diameter. The reproduction has no such ornamentation. The cases of both are tarnished and discolored from handling. At best, the reproduction bears a “strong resemblance” to the original (assuming the artifact can be dated to the late 18th century). It is not an exact copy. If done properly, adding the engraved circles to the outer case would add to the historic impression. In my estimation, having an exact copy made would cost in excess of $100.00. 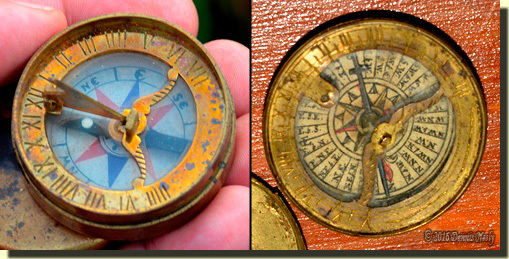 For the number of times I use a compass, the $30 version is acceptable, at least for now. So I didn’t come away from the Indian Art & Antiques Show with any great revelations about Northwest trade guns, at least not what I had hoped for. 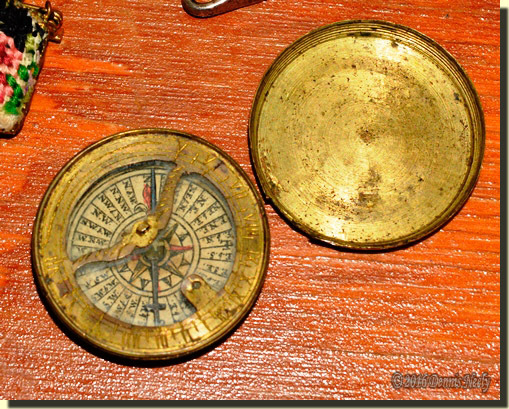 But by fostering a fertile mind, I came away with new knowledge on a number of fronts, including a better understanding of compasses. 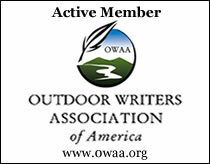 This entry was posted in Research, Squirrel Hunts, Turkey Hunts and tagged Black powder hunting, Dennis Neely, historical trekking, Mountain Man, Native captive, North West trade gun, Northwest trade gun, trade gun, traditional black powder, traditional black powder hunting, traditional blackpowder, traditional blackpowder hunting. Bookmark the permalink.